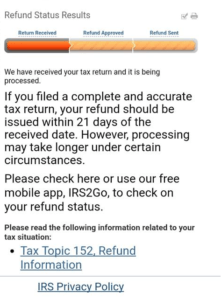 How many have received emails that tax returns are being accepted! Congratulations! 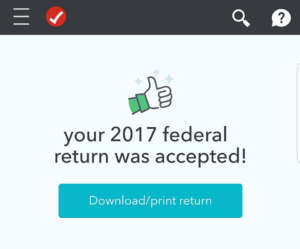 Accepted means your e-filed tax return has passed the initial inspection (Social Security numbers are correct, dependents haven’t already been claimed, etc.) and the government has your tax return. Consider acceptance as your official government delivery receipt. Does “accepted” mean my refund is approved? No – accepted means your tax return is now in the government’s hands and has passed the initial inspection (your verification info is correct, dependents haven’t already been claimed by someone else, etc.). First, they look for things like back taxes and unpaid child support. If they find any debts, they’ll offset (reduce) your refund to cover the outstanding amount. Once they are satisfied that you have no outstanding debts, they will approve and then issue your refund. 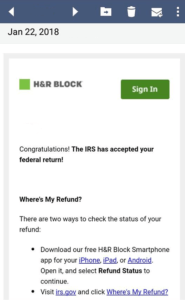 Once you’ve been accepted, start tracking your federal refund on the IRS Where’s My Refund site. 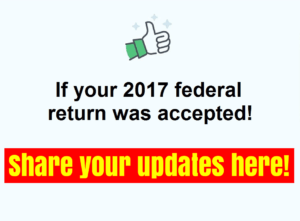 Check out our Facebook Group and Share all your tax refund updates here!